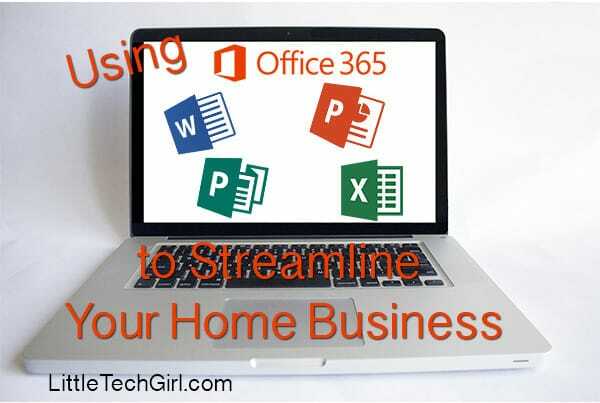 I have learned to love each component of Office to help me manage my home based business. Now that my wedding madness is over I am determined to be more organized. Now my wedding was beautiful, and it was worth the madness, but oy! I fell so behind in the months leading up to and after the ceremony. Now I’m playing catchup. It is not possible to run a business without being organized. It is very necessary. There are always posts to write, meetings to schedule, documents to draft, and conference calls. 1. Backup Your Photos: This is one of the first things that I set up on every smartphone that I own or test. We now use our smartphones each and every day to take photos. Although a lot of these may be for fun, some may be for business. I use my phone to take photos at media events, and I use it to take photos for blog posts. Don’t risk losing your photos if you lose or damage your phone. Using OneDrive you can instantly backup photos as you take them. Photos from your iPhone, Android, or Windows Phone can automatically upload to your OneDrive folder. You can also manually add photos from your Windows or Mac computers. Download the OneDrive app to your iPhone or Android and upload photos directly from your Gallery. 2. Create Flyers to Advertise Your Business: I have mentioned before that it surprises me how many people have not used Microsoft Publisher. If you run Office for Windows you should definitely be using it. Microsoft Publisher includes dozens of templates that create professional, colorful, and useful documents. I have used it for years to create calendars, flyers, postcards, and even business cards. I am hoping that Publisher is soon offered on the Mac as well. 3. Create PowerPoint Documents for Presentations or Speeches: Some people feel a certain way about PowerPoint presentations… meaning they don’t like them. I disagree. Since I give speeches on technical subjects having visual aids is always more interesting than just watching someone talk. I enjoy using PowerPoint to list bullet points, definitions, and take-aways for the audience. Depending on your audience and the amount of pizazz you are going for you can choose from a variety of themes that include as much or as little colors and flair as you like. 4. Create a Media Kit for Your Blog: I have listed this one before as one of my favorite things to do with Publisher. If you are a blogger you should have a media kit. If you don’t get to work! A media kit is a must for any blogger running their blog as a business. This should list the brands that you have worked with, your expertise, your blog statistics, your social media statistics, and your rates. You can customize an included template and adapt it to your media kit requirements, or start from scratch. There are several elements, borders, clipart, and more to help you make it unique and attractive. I have a couple of different versions of my media kit, one that includes rates, and another that highlights my social outreach. 5. Use Excel to Create Invoices: Excel includes a few very useful templates for creating invoices to send to your clients. I have used them for a long time. And if you use PayPal, there is even a plugin/invoice for Excel to allow you to send PayPal invoices directly from Excel. These templates allow you to change names, addresses, and add your logo for a professional look. These are just a few ideas that I came up to help you manage your business with Office 365. Spending a few minutes customizing templates or documents for your business using Office can go a long way in making a positive impression on your clients. Of course you can also create contracts, quotes, and much more. The full Office 365 Home Premium suite includes Word, Excel, PowerPoint, Outlook, OneNote, Access, and Publisher. There is an application to help you with most things that you need to get done. You can sign up for Office 365 Home for only $9.99/month. This allows you to use it on up to 5 computers in your home. And with 1/TB of OneDrive storage you can safely keep all of your business documents backed to to the Cloud and accessible from anywhere. Disclosure: This post is part of my involvement in the compensated Office 365 program. All opinions are my own.